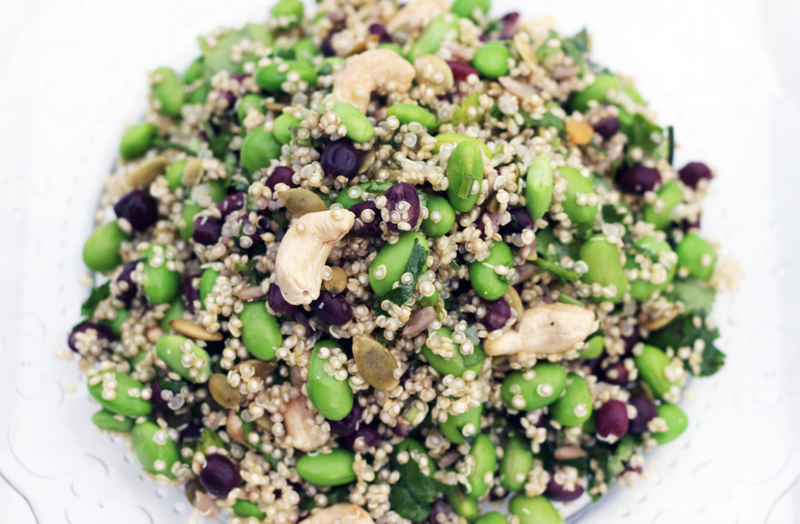 Quinoa, edamame, mint and quinoa salad with activated cashews and sunflower seeds - simply dress it with a little lemon juice, rapeseed oil and tamari for a fresh, yummy lunch option - beats a boring BLT, if you ask me! It's a common misconception that, in order to lose weight, you must deprive yourself of everything even remotely tasty. Though it makes sense in essence -"eat less, weigh less, duuh"- if you take a dramatic approach to weight loss, you can actually do your body much more harm than good, and it is almost inevitable that any weight lost will reappear as soon as you revert to normal eating habits. Joking aside, in nutrition, balance is key, and it is important to bring in all of the food groups to nourish your body fully. This is why I am such a great admirer of The Detox Kitchen, Lily Simpson's clever take on cleansing. Steering clear of intense all juice cleanses, Lily's detox packages consist of nutritious but delicious meals, snacks and juices, cleverly combined to flush out toxins, revitalise the body and satisfy all your cravings. Despite tasting absolutely glorious, the balanced plans can help you lose up to five pounds per week, depending on your starting weight, and leave your skin glowing. The packages are a little expensive for most of us, but the ethos behind The Detox Kitchen is priceless: forget calories and listen to what your body wants and needs - never, ever deprive yourself. Staying slim, healthy and happy is easy if you try - it's a marathon, not a sprint, and nobody can run on empty. Following a rather sluggish start to the year, I signed up for a one day trial of The Detox Kitchen post-party season Vegan detox. Opening up the box, I was delighted (not to mention relieved) to see lots delicious food - porridge with raisins, porridge! - and some incredibly healthy looking juices, shots and snack pots. 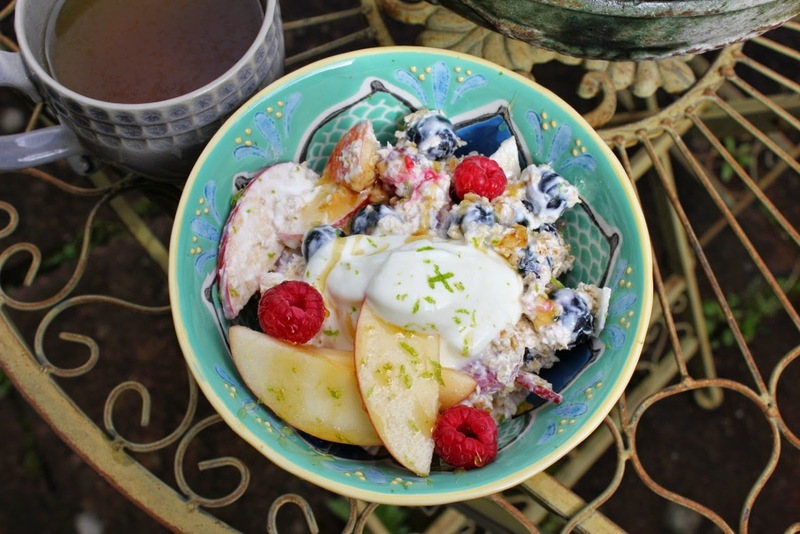 A plan typically consists of a healthy breakfast - usually with some form of starch, a two parts veg one part fruit juice and four nuts, a nourishing balanced lunch (yes, there are carbs), a raw veggie snack then a light salad or soup for dinner followed by fruit or vegan baking. My dinner was a delicious, and extremely filling, salad of tenderstem broccoli, kale, red pepper, green beans with a gorgeous tamari dressing and activated almonds for a protein hit - I am chasing the recipe so I can share it with you lovely lot. It's all washed down with lots of water, herbal tea and a little wheatgrass shot to kick things off (no coffee or alcohol here ladies, we are cleansing, remember?). 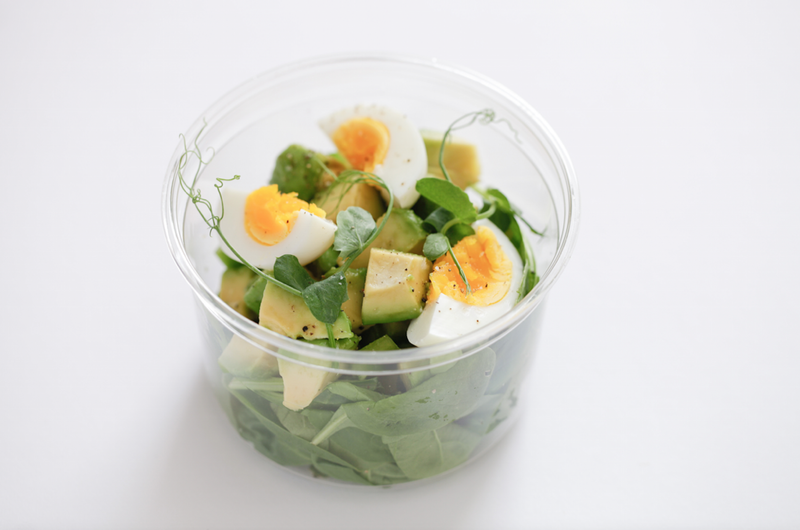 A super quick and simple snack pot of raw spinach, shoots, 1/2 an avocado and two boiled eggs - it's the perfect pre-gym protein hit. Make it a meal with this variation. Though I'm used to eating larger portions and snacking more frequently, the package was generally satisfying, with regular snacks to stave off hunger. As I am actually trying to gain half a stone, following a nasty bout of illness over Christmas, I cheated a little bit and added in a few pots of nuts and a slice of Biona Quinoa and Amaranth rye toast with dinner, but I could easily have gone without. Lily's tip is to differentiate between hunger and thirst, if you feel as though you could use a snack, have a cup of mint tea or water instead, and if the hunger persists have a handful of nuts or a veg-based juice. The packages are supposed to be a minimum of three days, but just one day appears to have done me a world of good - my indigestion is eased and I have a little more energy. You can tell you've done your body a world of good. The signature avocado salad - a gorgeous glow-getting lunch option. 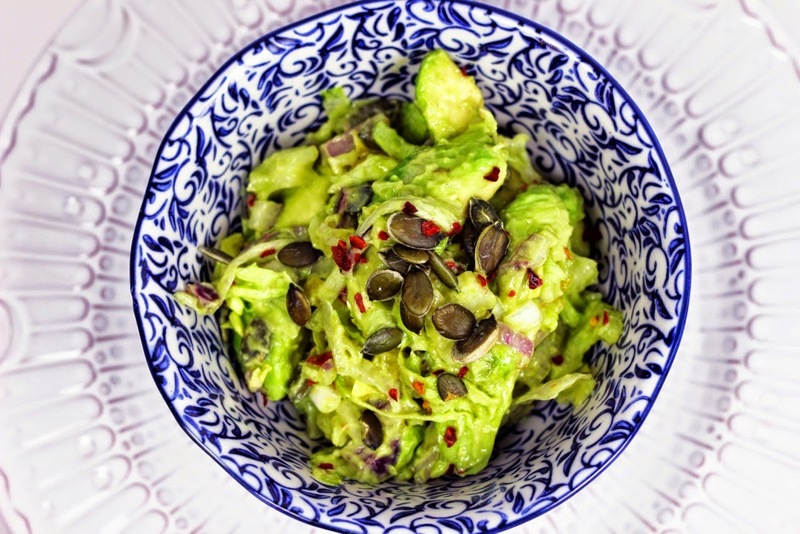 I don't have the exact recipe, but try blending avocadoes with coriander and lemon juice until it is a creamy consistency, then chop white cabbage, red onions, cashews, almonds and peppers, coat in the dressing and sprinkle with seeds and chilli flakes. For a protein hit, try this with a small chicken breast, baked in the oven with lemon and black pepper. As much as I would love to carry on with the packages for the rest of my life, instead I am going to do my own little home-made version, borrowing recipes from The Detox Kitchen website and waiting patiently for the upcoming cookbook. If you like the sound of the cleanses, you can book one here, or I have a little twist on the plan listed below, for you to try at home. I personally don't have a juicer, so instead I have substituted the juice for a small raw salad, as per the second snack of the day. Happy healthy eating! For more daily inspiration, be sure to follow The Detox Kitchen on Instagram at @TheDetoxKitchen.